Telehandler Training Courses Grande Prairie - Employers are responsible for making sure that their supervisory and operating personnel are trained to work competently making use of telehandler equipment. The competence level of employees should be assessed. If deficiencies are found, employers should provide training so that staff attain the needed level of skill. The level of responsibility of the person should be taken into consideration when training is offered. 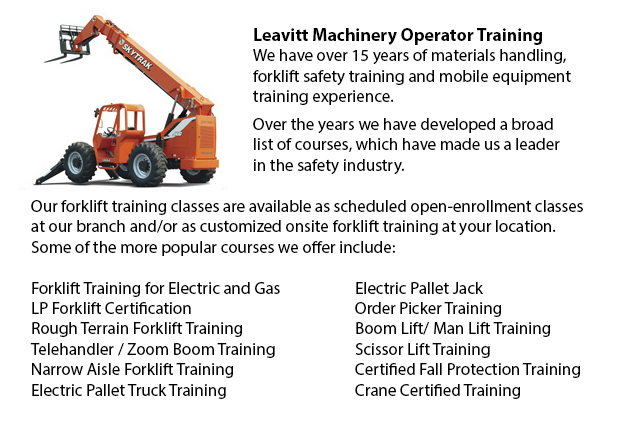 Effective training will remedy any deficiencies in the understanding, knowledge and skills of telehandler supervisors and operators. Training may be undertaken through in-house session or by engaging the services of an external training provider. An assessment at the completion of the training period will determine whether or not the learning goals have been met. Guidelines and regulations for the basic telehandler operator training and testing are set by federal, state/provincial and local regulators. Basic training does not address such topics as the lifting of people, the lifting of suspended loads, the utilization of rotating machines or the use of other attachments. Further training will have to be undertaken if such tasks are needed on the work site. Similar to whatever machine, a telehandler requires effective maintenance. The machinery inevitably will suffer wear over time. Proper maintenance is vital to ensuring safe utilization of the telehandler machinery. Inspections and checks are vital to ongoing maintenance measures. Operators must have machine-specific training in order to prevent, rectify and monitor problems connected with damage, wear and deterioration. Workers need experience and competence in both breakdown and periodic maintenance. The preventive maintenance directions of the manufacturer must be seriously viewed and complied with, considering such factors as environmental circumstances in the work setting and frequency of use. The responsibility for making sure that the telehandler and its attachments are in good working order lies with both the user and owner of the machine. General maintenance is normally performed by the telehandler owner whilst pre-use checks are normally done by the user.